On March 16, we attended an Intimate Science Get Together at Real Art Ways in Hartford, featuring Phil Ross and our own myco-friend, Connie Borodenko. It was advertised as "A conversation on fungus as artistic medium and sustainable architectural material", and featured physical examples of the building bricks fashioned by Mr. Ross from the mycelium of reishi mushrooms, Ganoderma lucidum. Connie was the opening speaker, talking about her family history of mushroom hunting and her own experiences with Connecticut Valley Mycological Society. She also helped answer questions from the audience about nutritional value and medicinal value of some of the fungi we find here in Connecticut. Connie also provided some samples of local conks, just about the only fungi we can find in the middle of March. Philip Ross talked about his fabrication process with the mycelium of the medicinal reishi, and explained its connection to his previous background of working with critically ill AIDS patients in the 1980's. His interest in reishi as alternative medicine is what brought him to studying medical aspects of mushrooms, and eventually to home cultivation of mushrooms as food. He became interested in casting the mycelium from the growing fungi into architectural elements, controlling the organic growth and potential fruiting of the fungus with humidity, temperature, pressure, and light. He also discussed how the bricks and molded structures, if left "alive", can be coaxed to grow together with their own kind of organic glue, bridging gaps in structures and creating bonds between bricks. Mr. Ross presented many slides of his works, including small structures and furniture. Several examples of his molded bricks were on display, including a small arch and and some of the more artistic and organic pieces. He participated in a question and answer session after his presentation, and his patent for fungal bricks as sustainable, non-toxic building material was mentioned, however he was not willing to discuss potential partners in his endeavors to making the fungal blocks a commercial success. He was willing to share the facts that the bricks are excellent sound dampeners, and fire resistant as well as light weight. There is an excellent interview with Phil Ross over at Glasstire, an art blog, that I highly recommend, called The Future is Fungal. The interview goes into more depth about his inspirations and his own educational process, citing Paul Stamets as a source of information and his thoughts on the future of fungal education. Many thanks to Connie for the invite out to the exhibition, it was also great to see other CVMS members in the audience to learn about the art of mushroom bricks. While the vernal equinox is not until March 20, more than 2 weeks away, it is starting to feel like spring around southeastern Connecticut. Most of the large piles of snow are melted and the ground is soft, the daytime highs are in the 40's and the sun feels wonderfully warm on our faces. We have ants in our pants to get outside into the woods and fields, ready to search for hints of life in tree buds and new growth among the dead leaves and grass on the ground. Searching for early spring greens is easier if you consider a few micro-climates, like proximity to a stream, low-lying areas of fields, and sunny hillsides. 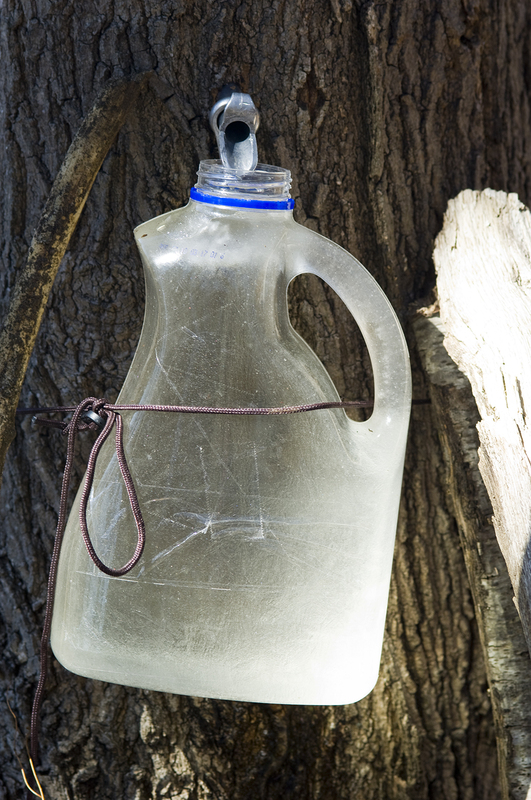 We have been tapping a few maple trees and collecting the sap for 2 weeks already. Most of the sap is being saved to make some wine, while some we drink plain as an energizing spring tonic. The sap is slightly thicker than water and contains small amounts of natural sucrose, glucose and fructose, along with trace amounts of malic acid, zinc, maganese, potassium, and calcium. We do not have an energy efficient way to boil down our sap, we have to use the electric stove in the kitchen, so making syrup is not a priority for us. If we were lucky enough to have an outdoor area to burn wood, we might consider making maple syrup, in very small amounts. 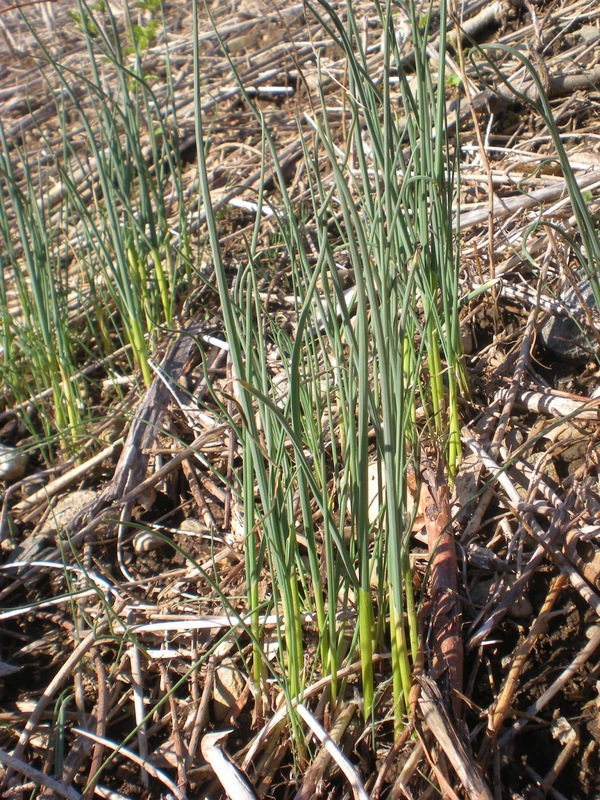 The wild onions (Alium vineale) are up in many yards already. 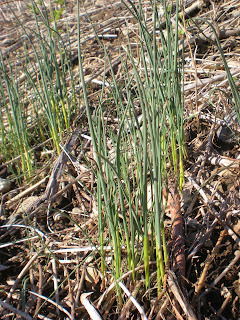 They look very much like chives, long hollow green tubes, but are lightly ridged along the length of the leaf. Some people may think the flavor is stronger than chives and some will not eat them at all, but we think they are good when very young and still tender. Chopped, they can be added to any dish like scallions or chives, baked into bread, mixed into cream cheese, and tossed into soup as a garnish. 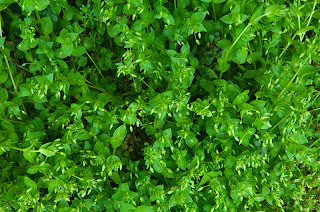 Along the margins of a sunny field we gathered hairy bittercress (Cardamine hirsuta) in its very early stages. Many are still too small to bother with, while others that are more exposed to the sun are showing their tiny, white blooms already. 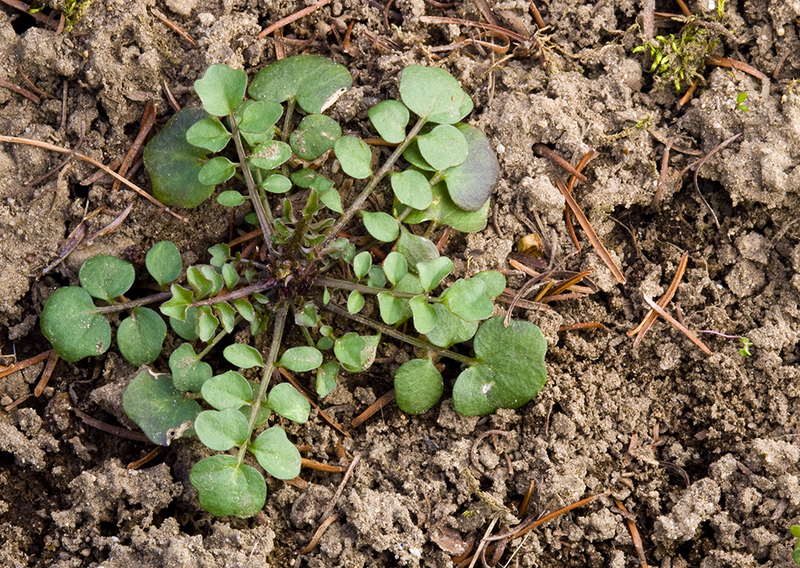 You'll only have a short time to get the bittercress before stems of the leaves get tough and too bitter, and the flowers make the elongated seedpod that explodes upon touching it. 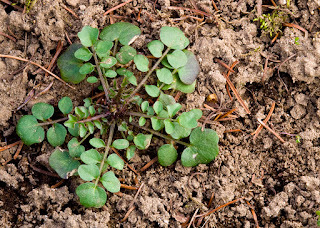 Bittercress is great raw in salads and cooked into stir-fries, and adds a peppery bite similar to arugula. Chickweed (Stellaria media) can be around almost the whole winter in sheltered areas near your house,like near the foundation or under bushes. It stays tender throughout the season, but the brighter green growth of the early spring is preferable. You look for heart-shaped or oval leaves arranged along the stem in opposite pairs, a single line of hairs along the stem, an a tougher, white string in the core of the stem. The flavor is very similar to sweet corn, and it is best eaten raw in salads, garnishing a soup, or blended into a smoothie. Other items we might look for include many of the root vegetables of perennials that we noticed at other times of the year. We could dig evening primrose, daylilies, dandelion, chicory, or burdock by revising old patches and looking for evidence of last years growth, like old, dried plant stalks. Spring is coming, along with the sweet young greens our bodies crave after the dark and cold winter. We are ready!